Google is set to let users pay off their debts without lifting a finger. The tech giant has announced a new feature that will allow users to transfer funds to friends or family via Google Assistant. Those living in the US will just say 'Ok Google, send $10 to Jane for pizza', and the AI will pull money from a linked debit card and forward it to the recipient. The new feature is part of the firm's roll out that lets users add a credit or debit card to their Google Account, enabling them to easily purchase goods online without using a physical card. 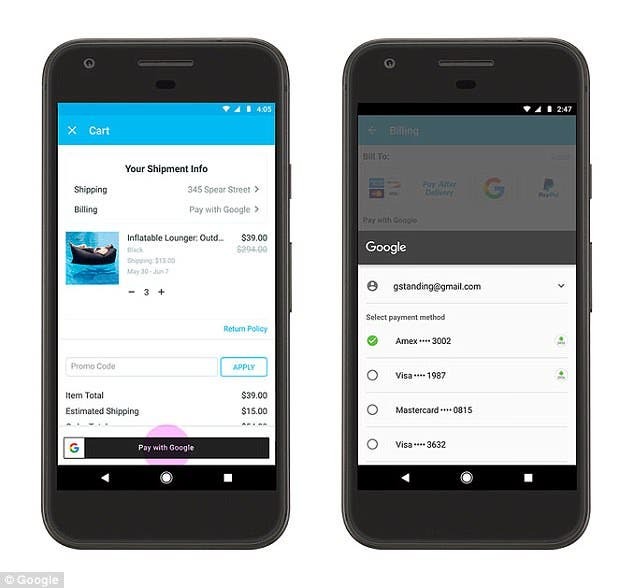 ‘For users, the option to pay with Google means breezing through checkout without needing to remember and type multiple lines of payment details,’ said Pali Bhat, VP of payment products. All you will have to say is ‘Ok Google, send $25 to mom’ and the system transfers money from the debit card linked to your Google Account to the recipient. The new payment system also includes features for merchants to engage and reward their customers ‘before they walk into the store and after they’ve left’. Google noted that Panera Bread, an American chain restaurant, is the one of the first companies to use this technology in the US. Google has also made it for Android Pay users to add loyalty programs. 'Walgreens Balance Rewards® members who manually apply their loyalty account with a phone number and use Android Pay will receive a notification on their phone that easily enables them to link that loyalty card to Android Pay for future visits,' Bhat explained. Has UAE Cracked The Code To The Mobile Wallet? Google has also revealed that Android Pay is now available in 10 markets and will soon be making its way to Brazil, Canada, Russia, Spain and Taiwan. The announcement comes about a year after Google began testing its digital wallets that lets people use digital wallets without having to even take smartphones out of their pockets. The Internet colossus is dabbling with ways to make its Android Pay system for smartphones hands-free, with verification by facial recognition. And today’s announcement seems to be another step in the direction of a hands-free world.